Tofu originated in China around 2000 years ago and has been a large part of the Asian diet ever since. In the UK tofu has risen in popularity over the last few years, especially amongst vegetarians and vegans due to its high protein and iron content. Referred to in the US as ‘bean curd’, tofu is made by coagulating soy milk and pressing into blocks through muslin cloth. The coagulation is achieved by the addition of either salt or acid. Brittle or ‘firm’ tofu is most commonly set with calcium sulphate – gypsum. This results in a tofu that is high in calcium. Firm tofu can also be produced by using seawater. Soft or ‘silken’ tofu is made with organic acids similar to those used in cheese making, most simply lemon juice can be used however this will flavour the end result. There are two types of tofu, firm and soft or ‘silken’. Soft tofu is not pressed and therefore is has a spongy, cotton texture hence the name silken. Soft tofu is not normally cooked, rather seasoned with savoury flavours such as soy, ginger and spring onion or sweetened and served as a dessert. Firm tofu is much more resilient as the liquid has been pressed out of it making it suitable for cooking. If you prefer a firmer tofu try pressing it further at home by placing a (clingfilmed) heavy book on top for a few hours. 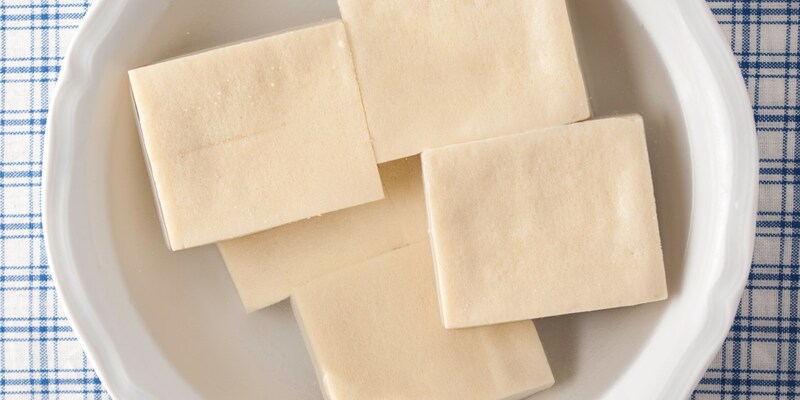 Tofu is great when baked, scrambled, dusted with corn flour and fried or even used in Miso soup. It can be used as a meat substitute or as an accompaniment as in Peter Gordon’s Pork belly, kimchi, smoked tofu, shiitake and peanuts. Freezing tofu creates cavities in the curd enabling flavours to be absorbed more easily. ‘Thousand Layer Tofu’ is tofu that has been frozen, then thawed as the holes look like layers. Tofu is normally associated with Asian cuisine so think along the lines of flavours such as soy, ginger, sesame and chilli. Take a look at some of our interesting blogger recipes for ideas, try Monica Shaw’s Five spice crispy tofu for a healthy vegan dinner.